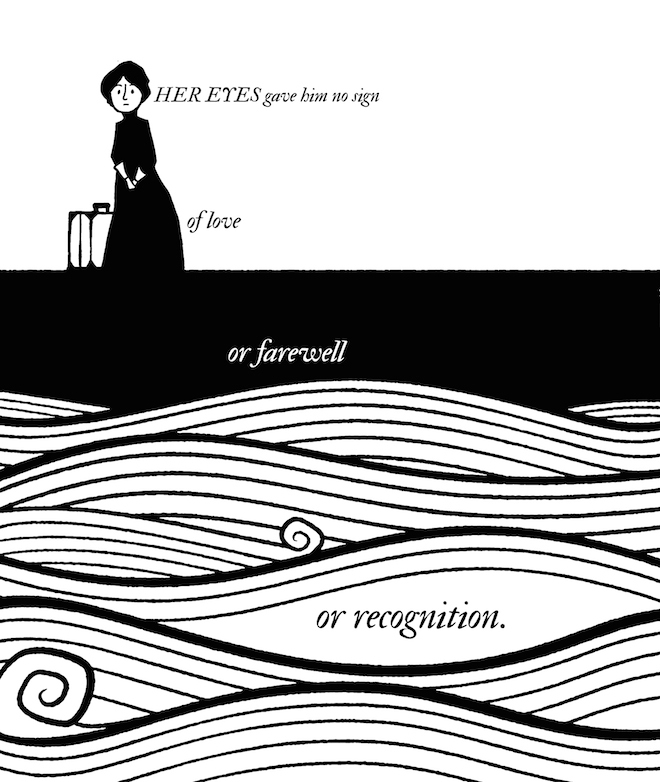 “Eveline” tells the story of a young woman who’s preparing to elope to “Buenos Ayres” with a sailor. But when the moment comes to board the ship, she’s gripped with such terror that she can’t even move. As with “The Sisters,” I didn’t have any trouble choosing a line to illustrate. The final sentence so perfectly encapsulates the tragedy of Eveline’s paralysis. But I couldn’t work out how best to communicate the feeling of motion. Whenever I read the final paragraph, I could see Eveline’s blank stare drifting further and further away as the ship left the harbour; but until animated gif technology comes to paperbacks, I knew I’d have to come up with something else. I did a few sketches of it as a six-panel comic, which worked quite well. But it was vetoed by my art direction consultant (or “wife”, to use her legal title) because it stuck out from the others. So instead, I made the text do the work. I think this really shows how handy text can be in an illustration, because there’s nothing like it for directing your eye. There’s still plenty of time to order a numbered first-edition at the funding campaign here. Tell your friends!